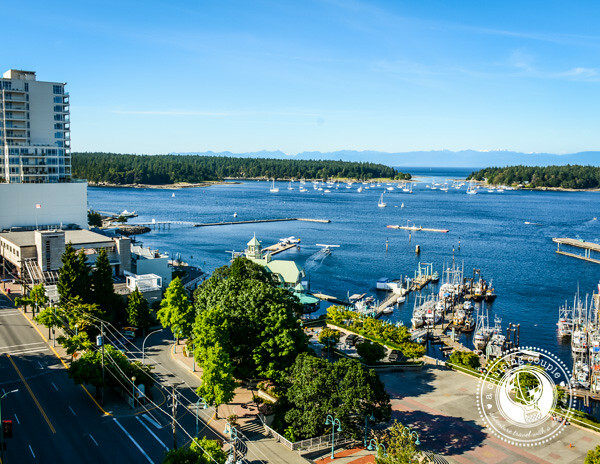 There is certainly no shortage of things to see and do in Nanaimo. British Colombia’s third oldest city, the streets are chock-full of history and culture, while its idyllic waterfront location provides plenty of opportunities for boating, paddling, fishing and swimming. But while we were certainly interested in all of these activities, they had to take a backseat to our primary Nanaimo objective: discovering Canada’s tastiest Nanaimo Bar! 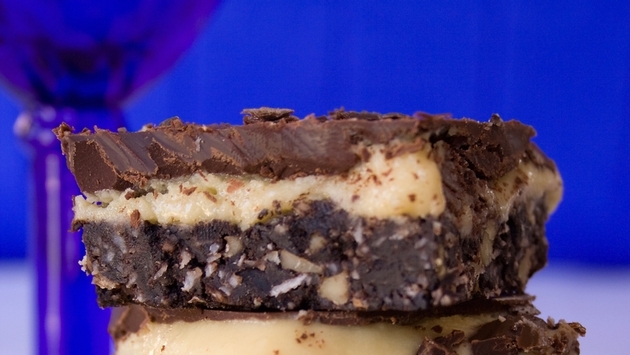 The Nanaimo Bar is regularly voted “Canada’s favorite confection,” and for good reason. With ultra-decadent layers of chocolate, cream and crust, just one bite of these tasty treats is all it takes to get hooked. 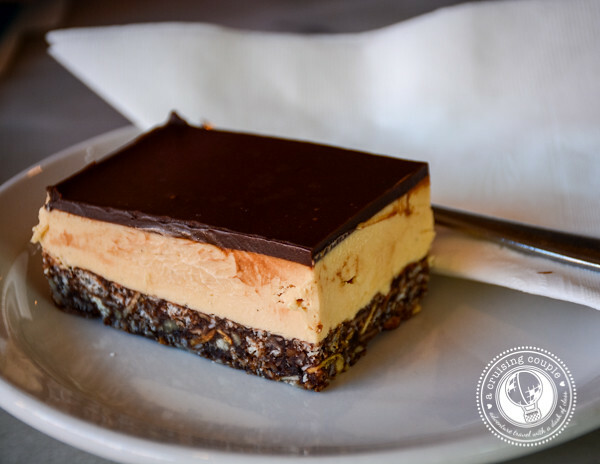 The history of the Nanaimo Bar is shrouded in mystery, with many conflicting stories over the actual origin of the bar. But most Nanaimo residents will tell you that the British first brought a dessert resembling the Nanaimo Bar to British Colombia, possibly as early as the 19th century. It wasn’t until 1953 though that the first confirmed printed copy of the recipe with the name ‘Nanaimo Bars’ appeared in Edith Adams’ prize cookbook. Origins of the bar aside, it is clear that the city of Nanaimo takes great pride in their signature dessert. Nearly every restaurant and café in Nanaimo boasts its own unique interpretation of the no-bake Nanaimo Bar, and the town has even crafted a “Nanaimo Bar Trail” with over 25 sugary stops for the most devout of sweet-tooths. With just 24 hours in the city, we didn’t have time to hit up every stop along the trail, but we did do our best to sample as many varieties as possible. If we couldn’t try a twist on the Nanaimo Bar first-hand, then we asked for exclusive insider advice from Nanaimo residents. Tasting the Classic Nanaimo Bar is an absolute must if you are to fully appreciate the various twists on the original recipe. Almost identical to the version on display in the Nanaimo Museum, the classic recipe consists of an almond and graham cracker crust, a creamy custard filling, and a chocolate ganache topping. Being from North Carolina, we are no strangers to combining bacon with chocolate (or anything for that matter). Though we can’t say we love the meaty addition to our dessert, the sweet and salty combo does makes sense. So perhaps it should come as no surprise that it was the Bacon Topped Nanaimo Bar from Smokin’ George’s that won the 2014 DNBIA Nanaimo Bar Competition. Choose to only eat organic, raw, vegan or gluten-free? Don’t worry—there are still plenty of Nanaimo Bars to fit your special dietary needs. Though I’m not sure it makes them any healthier, at least you can rest assured about the ingredients you are consuming. 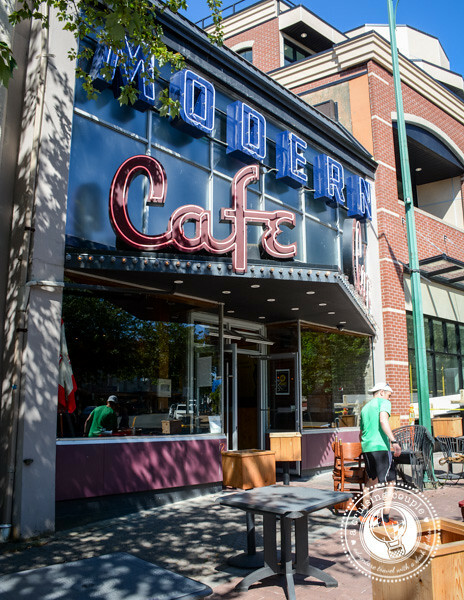 For the best gluten-free bar, and according to some the best Nanaimo bar in general, head to Mon Petit Choux. This traditional French bakery makes a Nanaimo bar with a wonderfully crunchy rice crispy base. The lovely owner is also as friendly as could be. The Wee Cupcakery created their unique spin on the Nanaimo Bar recipe by mixing up the layers and ingredients but keeping the flavors largely the same. Their specialty cupcakes come with a coconut base, a fluffy chocolate cake center, and a creamy custard icing topping. We’ll take five. For those who prefer a sippable sweet, look no further than the Nanaimo Bar Martini. The Modern Café keeps it elegant with layers of crème de cacao, vanilla vodka, chocolate sauce, and espresso. Unfortunately our Naniamo Bar tour was at 10 a.m., and for some reason the Modern Café wasn’t serving up their martinis just yet. But this drinkable dessert is reason enough for us to make a return visit to Nanaimo. Skip the sashimi and try a Nanaimo Bar Spring Roll instead. For this unique alternative, think deep-fried chocolate and cream served with a coconut dipping sauce. Bon appetite! If you can’t take any more sugar but you’re still craving another Nanaimo Bar hit, don’t worry. You can also get a Nanaimo Bar pedicure, pick up some Nanaimo Bar tea towels, or redecorate the garden with a Nanaimo Bar bench! 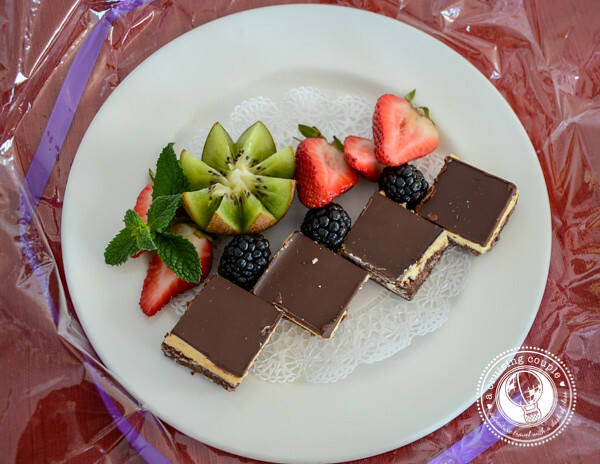 With so many delicious options along this tasty trek, there’s no excuse to leave Nanaimo without sampling at least a few different Nanaimo Bars. But if you’re not headed to Nanaimo any time soon, don’t let that hold you back, either! You can try your hand at the original no-bake Nanaimo Bar from the comfort of your kitchen with this easy recipe. You can follow the whole Nanaimo Bar Trail with this awesome walking tour here. A huge thank you to the Nanaimo Tourism Board for taking us on a walking tour of Nanaimo and helping us to pick out some of the best Nanaimo Bars around!